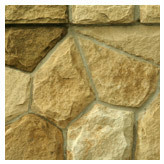 We are the premier producer of natural Sandstone Thin Veneer in the Santa Barbara area. Available in Mission and Presidio styles! ® StoneYard Building Materials 2001-2009.